Installing Tier on Tier Shutters in bay windows is a perfect way to combine practicality with stunning looks in your home. Both bay windows and these types of shutters are stand out features in any home, therefore a combination of the two is a sure way to create a truly breath taking interior! What are Tier on Tier Shutters? Tier on tier shutters are an alternative to full height shutters. Their unique feature is that you can open and close each tier (the top or bottom section of the shutters) independently from each other. Naturally, this feature brings many benefits! For example, tier on tier shutters are perfect for filling your room with light whilst still maintaining privacy in your home. This can be done by keeping the top half/tier of the shutters open, but the bottom half/tier closed. As a result, your home will feel bright and airy – without any prying eyes being able to see inside! See more examples of our Tier on Tier Shutters by clicking here. 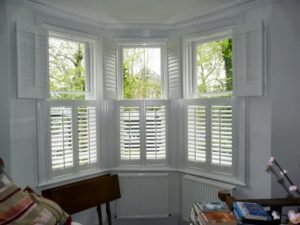 Why are shutters perfect for a bay window? Bay windows are a delightful and sought after feature in many homes. This is as a result of the plentiful amount of light they let in. However, bay windows tend to be rather large and impose of the privacy many people desire. Therefore, the installation of shutters in them is a perfect solution! Installing Tier on Tier Shutters in bay windows is doubly as beneficial. This is because you are maintaining privacy, creating a light atmosphere and displaying a beautiful feature in a room all at the same time!